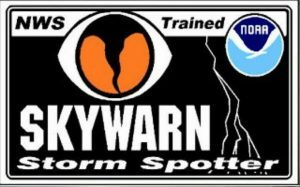 We’ll tackle two topics during this edition of the All Hazards Communications Preparedness, The first is the annual Skywarn Recognition Day for volunteer specially trained severe weather spotters who are mostly amateur radio operators. This year it was held on Saturday, December 1 at many locations throughout the country. I attended the event at the National Weather Service Forecast Office in Columbia, South Carolina located on the Columbia Metropolitan Airport. The second topic is an introduction to applications for radio communications. In addition to mobile device apps there are dozens of different digital modes of operation transmitted and received via computer. The entire subject is very wide scope. Consider this week’s show to be an introduction to the topic. Skywarn Recognition Day included educational seminars and I especially enjoyed the weather radar images interpretation session. There was also an operating amateur radio station which is permanently installed at the Weather Service Forecast Office for use during weather emergencies. An Emergency Management Communications trailer was also on site. I’ll share with you what I learned during the Tuesday show live on the Prepper Broadcasting Network from 9 to 10 p.m. Eastern. The second topic, mobile device apps, mainly for Google’s open source Android and Chrome operating systems. Most of these type of apps are written for Android devices and I have chosen several apps to discuss including the app for Echolink. EchoLink is a system which allows licensed amateur radio operators to communicate with each other via local radio repeaters all over the world. There are several categories of apps and software for radio communications and we’ll take a look at some of those categories. The apps range from radio and electronic learning to test preparation for amateur radio licenses examinations. There are also apps that to link to radio equipment for operation using mobile devices. Join All Hazards CommPrep on Facebook HERE! Archives, website, & more for All Hazards CommPrep HERE! Previous: Previous post: K9 EDC and Tactical Gear!